Jonathan Franzen’s Freedom was the runaway most-discussed novel of 2010, an ambitious and searching engagement with life in America in the twenty-first century. 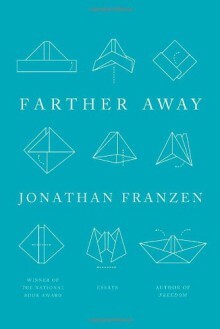 In The New York Times Book Review, Sam Tanenhaus proclaimed it “a masterpiece of American fiction” and lauded its illumination, “through the steady radiance of its author’s profound moral intelligence, [of] the world we thought we knew.” In Farther Away, which gathers together essays and speeches written mostly in the past five years, Franzen returns with renewed vigor to the themes, both human and literary, that have long preoccupied him. Whether recounting his violent encounter with bird poachers in Cyprus, examining his mixed feelings about the suicide of his friend and rival David Foster Wallace, or offering a moving and witty take on the ways that technology has changed how people express their love, these pieces deliver on Franzen’s implicit promise to conceal nothing. On a trip to China to see first-hand the environmental devastation there, he doesn’t omit mention of his excitement and awe at the pace of China’s economic development; the trip becomes a journey out of his own prejudice and moral condemnation. Taken together, these essays trace the progress of unique and mature mind wrestling with itself, with literature, and with some of the most important issues of our day. Farther Away is remarkable, provocative, and necessary.